Approximately 1,200 HIV positive patients are to be provided with employment opportunities this year by the Strategically Managing AIDS Response Together at the Workplace (SMARTWork) project, announced SMARTWork Technical Manager Dao Thi To Nga. A conference was held on Tuesday, by SMARTWork and the HCMC Department of Labor, War Invalids and Social Affairs, on HIV/AIDS prevention at the workplace and creating employment for people with HIV. It was agreed by all attending the conference that HIV positive patients are capable and should be encouraged to work. Equal opportunities and improved healthcare services were discussed as important factors in ensuring people with HIV can perform and reach their full potential in work. Companies employing people with HIV/AIDS were called upon to apply suitable social welfare programs to create better working conditions for their HIV positive staff. The SMARTWork project, funded by the U.S Department of Labor, is an educational program on HIV/AIDS implemented in six countries worldwide: the Dominican Republic, Haiti, Ukraine, Nigeria, Viet Nam and Zimbabwe. The projects priorities are to reduce stigma and discrimination and to provide more job opportunities for those with HIV/AIDS. According to Ms. Nga, SMARTWork’s main aim this year is to raise awareness of HIV/AIDS prevention among employers and 4,000 laborers in local industrial zones and factories. In related news, a project which focuses on protecting disadvantaged children in Tan Quy, District 7, Ho Chi Minh City, against the threat of the HIV/AIDS infection has been licensed by the HCMC People’s Committee. 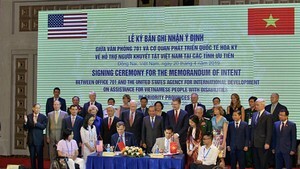 A total of VND720 million (US$45,000) has been given to the HCMC Children’s Sponsor Association by the Terre Des Hommes Germany to implement the project.